Video producer and spreadsheet geek Jon Jivan has provided the world with a fascinating glimpse into the language development of a baby by making public his son's first words since birth, compiling them into data points on a graph to illustrate the exponential growth in his language acquisition. 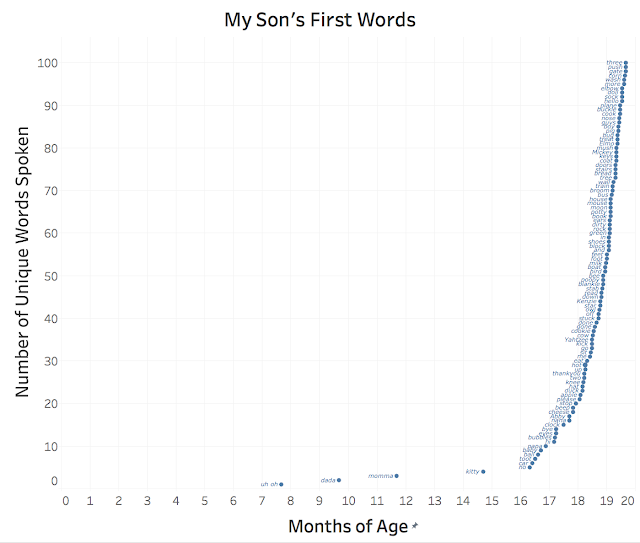 As the graph shows, his first word was "uh-oh" (if in fact that is a word), which occurred during his 8th month, followed by "dada" in the 10th month (and I'll bet Jon is chuffed with that! ), "mama" in the 11th month, and "kitty" at month 15. After 16 months, the pace picks up with a vengeance, with new vocabulary coming thick and fast in an almost exponential gowth progression: "no", "car", "toot", "ball", " baby", "papa", "hi", "bubbles", "eyes", "bye", "clock", "nana", etc. By 19 months, the toddler was up to 100 words. "No" was word number 5, although "yes" wasn't even in the top 100 - no surprise there for most parents. "Please" was number 21 and "thankyou" number 27, which I'd say is pretty impressive.